Map It! 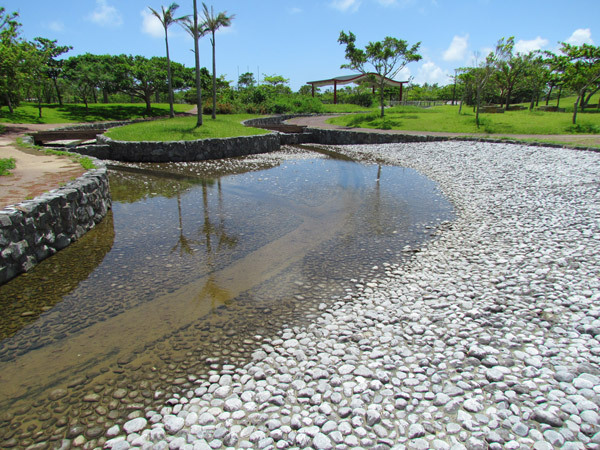 Okinawa: "Kanna Dam Family Park"
Looking for a quiet place to spend time with the family? You may want to try the 'Kanna Dam Family Park'. As the name suggests, this park is located right next to the Kanna Dam in Ginoza Village, not to far north from Camp Hansen. It's fairly a large park with a open green fields. A large frog pond lies northeast of the main park area. Every year around July, the Village of Ginoza puts forth a festival called the "Kanna Dam Matsuri" or appropriately, The Kanna Dam Festival (Some pictures from the 2011 Festival). This is a very quiet park for the most part (perhaps because of its location), which makes this place all the better. 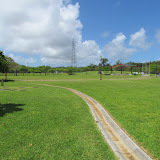 The park is great place to take a group out to play soccer, baseball, football, and of course, have 'bento' meal for lunch near the large shaded pavilion or under one of the small trees. They have a little man-made fountain and pool area for kids to play in (See photo album above). It is also great place to take your bikes and have your kids ride around without having to worry so much about traffic. Unless, there is an event, this park is very quiet and serene. If you are looking for a quiet place to stop and just relax for 30 minutes or longer, then this is the place. Facilities: They do have soda machines and a small bathroom area. Parking: There is plenty of parking near the park. See the green thumbtack. Getting there. The turn-off to get this park is right off Highway 329. Don't worry about getting lost in this area. You may end up seeing some other points of interest, in particular the Kanna Dam. Other places of interest nearby: Kanna Dam (Frontal View), Ginoza Belly Button, School of Killifish Pond. This is a great park, I love taking my family here, it is so relaxing.